"Battle of Veracruz" redirects here. For other uses, see Battle of Veracruz (disambiguation). After the battles of Monterrey and Buena Vista, much of Zachary Taylor's Army of Occupation was transferred to the command of Major General Winfield Scott in support of the upcoming campaign. :237 That campaign, determined by Scott and other Washington officials, would be a Veracruz landing and an advance inland. :233 Mexican military intelligence knew in advance of U.S. plans to attack Veracruz,:204 but internal government turmoil left them powerless to send crucial reinforcements before the American assault commenced. These two forts included 3,360 men and 89 guns: artillery, 2d and 8th infantry regiments, 3d Light Regiment, a picket of 11th Regt., Puebla Libres, Orizaba, Veracruz, Oaxaca and Tehuantepec national guards. Battalions, sappers and enlisted marines. Fort San Juan de Ulúa – offshore on the Gallega Reef. Gen. Jose Durán with 1,030 men and 135 guns::245 artillery, Puebla and Jamiltepec activo battalions, companies of Tuxpan, Tampico and Alvardo activo battalions. See Orders of Battle Mexican War. Conner's Mosquito Fleet moved to within 90 yd (82 m) of the beach to supply covering fire if necessary. :241 By 12:15 pm on 9 March, this force was off Collado Beach, followed by larger vessels over the next three hours and a signal for landing the surfboats at 5:30 pm. :244 Just before the main force touched the beach, a gig dashed ahead, and General Worth with his staff jumped ashore. :244 Worth's whole division landed without firing or receiving a single shot. By 11 pm, Scott's entire army had been brought ashore without a single man lost,:244 and the first large scale amphibious landing conducted by the U.S. military was a success. 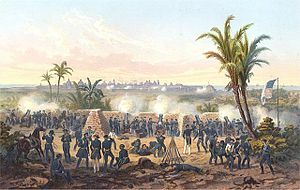 The obstacle to an advancement to Mexico City was removed and Scott made immediate plans to leave a small garrison at Veracruz and march inland, his first objective being Jalapa. :259–261 Along the way, Scott would in fact encounter a sizable Mexican army under Santa Anna at the Battle of Cerro Gordo. Alcaraz, Ramon, "Apuntes Para la Historia de la Guerra Mexico y los Estados Unidos"
Skelton, Ike, "It Ain't New"
Tschanz, David W. "Yellow Fever and the Strategy of the Mexican-American War"
Annual Reports 1894, War Department lists trophy guns: 3 – 16-pounder, 3 – 12-pounders, 1 – 8-pounder, 2 – 6-pounders, 1 – 4-pounder and 1 – 10-inch mortar. This page was last edited on 29 September 2018, at 15:18 (UTC).